Stolspeed VGs are more ‘User-Friendly’ and Better Looking than other vortex generators. Stolspeed VGs have been completely redesigned from all other vortex generators on the market to be much more user-friendly and better looking, while still retaining the aerodynamic effectiveness that vortex generators are renowned for. See Design. Stolspeed VGs have a very slim rounded fin to give them good flexibility, and a rounded, tapered base that ‘flows’ into the wing surface. They really do look like they’re meant to be a part of the wing rather than a ‘stick-on’. In clear material they’re almost invisible. Brush your hand over Stolspeed VGs and you can feel the flexibility. 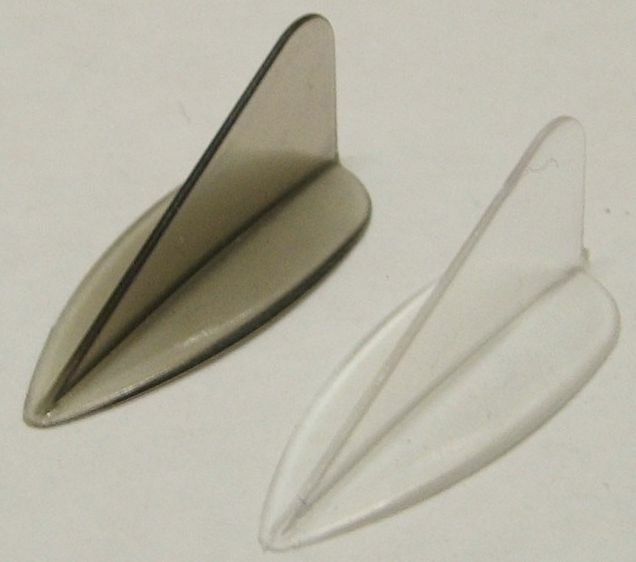 Other vortex generators are sharp, angular and rigid, and are a real nuisance when refuelling, washing, or covering wings – you wouldn’t dare brush your hand over them! When you really need Feathers! The rounded shape of Stolspeed VGs works really well with wing covers or washing. – no points to snag. The flexibility protects the wing skin and prevents the VG being knocked loose with impact. That flexibility is really essential for fabric covered wings. Put Feathers on your wings, and fly like a bird! I have just discovered the perfect adhesive for mounting Stolspeed VGs. It's produced by 3M, and comes as a thin sheet of tacky adhesive sandwiched between two backings. 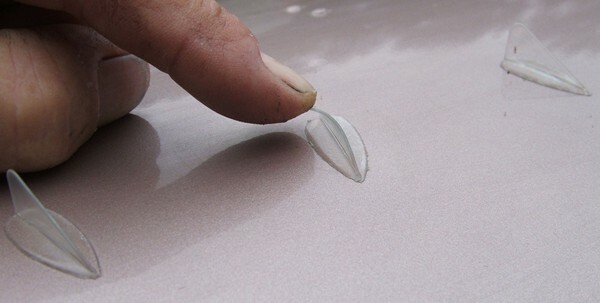 It's a solvent-free acrylic adhesive that holds very well, but can be easily removed with no damage to the paint. It remains flexible, so can take a severe knock without breaking loose, but can be removed by a long steady hard pull. Then to remove the last of the adhesive from the paint just rub it with your thumb and it rolls up into a rubbery ball - quite amazing stuff! It's also transparent, so when you place the VG, the colour of the underlying paint shows through vividly, making the base almost invisible.